Clematis is one of the most popular of all climbing vines. Clematis flowers are irresistibly beautiful and indispensable in the garden. They are used to liven up any dull space by growing them on fences, arbours, pergolas, obelisks, or over large shrubs and conifers. Clematis is primarily a genus of woody climbers, however, some of them are herbaceous or woody only at the base. In general, Clematis is propagated vegetatively at commercial nurseries by means of softwood cuttings, the herbaceous ones(perennial Clematis) can also be divided. When Clematis is potted up for growing on, the rooted cuttings must be planted deep, the eye under the soil and when planting into the permanent garden site, the shrub also should be planted deeply, the crown covered by 4cm loose soil. Clematis develops climbing leave stalk and in order to let a wall covered by Clematis optimally, the material on which the plant clings, may not be fixed, tight to the wall but a space of 4cm should be kept. A wall which already is covered by Hedera is ideal for Clematis growing on. A special colourful effect can be reached if Clematis in different colours is planted near the base of a tree and let the Clematis climbing in it. Clematis should be protected against sunrays at the base. They grow best in a woodland setting or in other bright shade. Perennial Clematis such as Clematis angustifolia, Clematis ‘Aromatica’, Clematis ‘Durandii’, Clematis hirsutissima, Clematis heracleifolia and its cultivars, Clematisintegrifolia and its cultivars, Clematis ‘Jouiniana Praecox’, Clematis recta and Clematis stans grow very well in the full sun in the border. In the scope of this article it is impossible to describe all the species and cultivars. It would require a book of at least 1000 pages. Therefore, I will confine to the newest breeds of the famous Dutch Clematis Nursery of Jan van Zoest and the breeder Wim Snoeijer. The Clematis nursery of Jan van Zoest is located in the old tree nursery area of Boskoop, also mentioned ‘the green heart of Holland’.When Jan and his wife Lina started their nursery in 1976, they initially grew the typical Boskoop area products, like Euonymus; Hydrangea; some conifers and Clematis.It took 20 years before they got specialized in growing and breeding Clematis only. What happened? 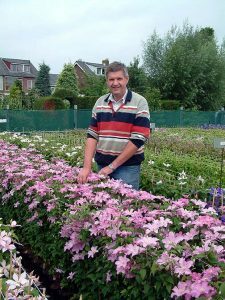 In 1996, the world-famous Clematis grower-breeder-collector of Clematis Jan Fopma retired and it was Jan van Zoest who was lucky by taking over the collection; the cultivars as well as numerous unnamed new seedlings of Fopma’s breeder Wim Snoeijer. At the end of this article some information about Wim. Generally spoken, it takes about 10 years on average after the cross pollination before a new cultivar can be introduced on the market. There is not much published in Literature about breeding of Clematis. Breeding Clematis mostly is based on experience and for a breeder it is essential to keep even the smallest detail recorded of each step which has been taken to breed new varieties, even up to 20 years ago. It is a rich source of information and avoid to make again the mistakes, made in the past. To understand the Clematis Cultivar Group Classification, requires detailed knowledge of Clematis breeding, though crossing of different Clematis groups are standard to reach the aim. For example: to get a Diversifolia Group plant, a Integrifolia Group cultivar must be cross pollinated with a Patens Group cultivar. If you want a Texensis Group plant, a Viorna Group cultivar also must be cross pollinated with a Patens Group cultivar. Diversifolia derives from the Latin word ‘diversus’ and ‘folium’. It means: different leaf shapes onthe same cultivar. Integrifolia derives from the Latin word ‘integer(integri)’. It means: simple, non-serrated leaves. Patens derives from the Latin word ‘patere’. It means: protruding widely; jut out widely. Texensis derives from Texas. It means: from Texas , EastState of North America, first found in Texas. Van Zoest holds on to a very strict principle of selections criteria, this for several reasons. there are too many Clematis introductions which does not meet the required expectations. looking for new shapes and new prospects for usage. Already 70 years ago, before the 2nd world-war, Clematis was grown for the production of cut flowers. The cultivar Clematis ‘Durandii’ was used for this purpose. In Japan, Clematis is grown for this purpose since decades. It is also the breeding aim of Van Zoest to get more colours and strong Clematis cultivars which can be used for cutflower production. The first, successfully introduced Clematis cultivar by Van Zoest for the purpose in question is Clematis BLUE PIROUETTE, bred by Wim. It is produced in Africa for the Dutch flowermarket with stem lengths of 50 to 70cm. The vase-life is 2 to 3 weeks!! In the meantime, about 40 Van Zoest Clematis introductions conquer the world of which the followings really are top of the top. This Series was introduced last year for the first time. This series belong to the Diversifolia Group. The flowers are star-shaped , which is completely new in Clematis. The plants are fully hardy. Three cultivars are available: ClematisBLUERIVER; Clematis EAST RIVER; ClematisSTARRIVER. It are fully double flowering Clematis cultivars of which Clematis DANCING QUEEN and Clematis DANCING KING has been introduced in 2007 and 2008. A newdouble white flowering variety with bronze leaves in this series will be introduced in 2009. The texensis group of Clematis remain popular. Well-known older varieties are: Clematis ‘Duchess of Albany’; Clematis ‘Gravetye Beauty’ and Clematis ‘Princess Diana’. After years of breeding and selection, Van Zoest introduced his own cultivar, Clematis MIENIE BELLE, which is the pet name of Jan Fopma’s wife. It is a very floriferous one. The flowers are tulip-shaped; the colour is light pink. The Viticella group of Clematis is quite favourite by gardeners and plant collectors. The plants are fully hardy; healthy; floriferous and shows a special colour effect if combined with climbing roses. The choice in cultivars; colours; flower-sizes etc. is enormous, but Van Zoest introduced a white one in 2007, Clematis ‘Maria Cornelia’, named after the mother of the German breeder, Willem Straver. The flowers are round-shaped; the colour is pure white. Other VZ Viticella introductions are: the purple Clematis ‘Little Bas’; the white, pink edged, Clematis I AM LADY Q and the purple-red Clematis JOHN HOWELLS. Wim, born in 1960 in the Dutch city Gouda, close to Boskoop, got interested in plants for ‘no particular reason’ he says. He attended the HorticulturalCollege in Boskoop and became a certified and registered landscaper. After having finished his military service, he became a garden and flower designer. In 1985, Wim became the head gardener at the premises of the Pharmacology Department of the famous University in the old DutchCityLeiden. Part of his job was to check the taxonomy and nomenclature of plants used by the scientific staff and got interested in the field of science in question. As a consequence of his scientific research, Wim, published a couple of checklists on nomenclature of Humulus and Cannabis. Wim also became the Registrar for the ICRA (International Cultivar Registration Authority) for Catharantus, synonym Vinca, a tropical annual which is produced on a large scale. The plant contains 2 different important alcoloids which are used against the Hodgekin decease and Leukaemia, two severe forms of cancer. It is said that, in particular children, are fully cured of Leukaemia if treated by the alcoloids in question. It was in 1988 that Wim got interested in Clematis. He had heard about the Clematis breeder Jan Fopma , having a vast collection of Clematis and decided to pay him a visit. Wim was very impressed. Jan Fopma was in that time a well known world traveller for collecting Clematis. He visited Clematis breeders/collectors, such as Skinner in Canada; Magnus Johnson in Sweden and……MRS. BESKARAVAINAYA in RUSSIA!!! !It was at Jan Fopma’s nursery, where Wim took the first Clematis pictures. It was a matter of time that Wim undertook Clematis breeding himself and being specialised in taxonomy and nomenclature, Wim discovered soon that the published parents of a certain Clematis cultivar were not correct. To prove he was right, he did a similar cross to check its parentage. He checked the parents of Clematis ‘Aromatica’ and bred a pink Clematis ‘Durandii’ introduced with the name Clematis INSPIRATION, which is also produced in Japan as a cut flower. Over the years, Wim got several European; Japanese and American Patents on his introductions. 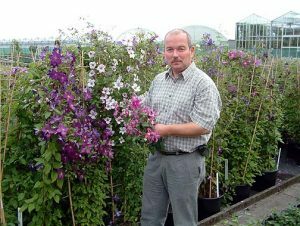 When Jan van Zoest took over the Jan Fopma collection and breeds, Wim was “PART OF THE DEAL”.Nowadays, Wim is a well-known leading commercial Clematis breeder among the very few in the world. Wim’s main interest at the moment is Clematis Cultivar Group Classification as after many years of cross-breeding, Wim is quite aware of the relationships between the Cultivars and the Cultivar Groups of Clematis. He privately published a book about the subject recently, see for more information on the website of the International Clematis Society. In the years passed, Wim has collected over 2000 herbarium samples, covering 800 cultivars and species, all deposited at the National Herbarium in the Netherlands in the City of Leiden. Many garden lovers benefit and will benefit in the future of Wim’s passion for breeding Clematis.